Next to the Pazyryk carpet the most famous carpets in Oriental rug history are the Ardabil carpets. 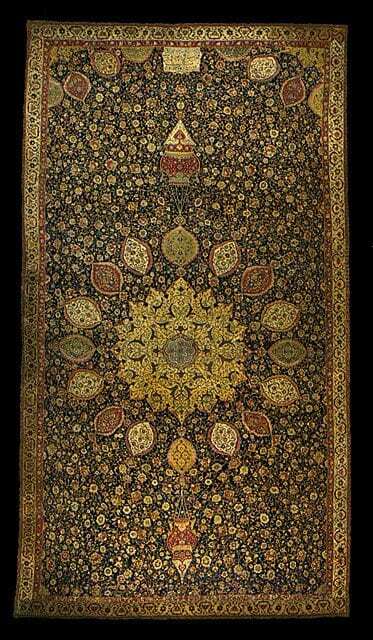 The Ardabil carpets are a pair of twins, weaved in Persia in the 16th. century. One of the carpets are exhibited in Victoria and Albert Museum in London and the other in Los Angeles County Museum of Art. The carpets are woven in 1539-40 according to the dated inscriptions. The foundation is of silk and the pile of wool with a knot density at 300-350 knots per square inch ( 470-540.000 knots per square metres). The size of the carpets are 34 1/2 feet by 17 1/2 feet ( 10,5 metres x 5,3 metres). The carpet in Los Angeles has the following inscription in the wool pile: Other than thy threshold I have not refuge in this world. My head has no resting place other than this doorway. Work of a servant of the court, Maqsud of Kashan, the year 946 (1539-40). “That two identical Persian court carpets have survived makes these carpets extraordinary, but rarer still is the fact that they are signed and dated”, says LACMA Costume and Textiles Curator Dale Carolyn Gluckman to Jozan Magazine. The Ardabil Carpets were created in Tabriz, Kashan or Mashad and the name Ardabil used be course they were originally housed at a large shrine in the city of Ardabil. The Ardabil Carpet from the Los Angeles County Museum of Art has just returned after international conservation efforts, cleaning and repair. Restoration took place at the Royal Palace Textile Conservation Studios at Hampton Court Palace, London. A special presentation of the Ardabil Carpet will take place in the Atrium of Los Angeles County Museum of Art’s Ahmanson Building from January 22 through May 11, 2004. The Ardabil Carpets was purchased of an English carpet broker at the end of the 19th century and the lower field and border of one of the carpets used to restore the other. This restored carpet was sold to Victoria and Albert Museum in London. The other was kept as a secret until 1931 and donated to Los Angeles County Museum of Art in 1965.